Costa Del Paradise are proud to be able to provide you with a Mobile home park only 10mins drive from Benidorm. 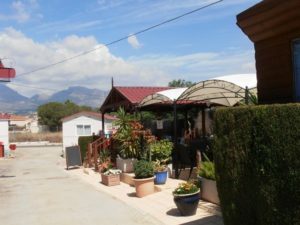 This lovely park has been established since 1980 and is one of the original mobile home parks in the residential area of Albir. Within a short stroll you will find yourselves in the cosmopolitan town centre where there is an abundance of bars, shops, supermarkets and restaurants. For those of you looking for a beach location this is just perfect with Albir Beach & Promenade only 15mins walk away. If you are looking for a park where there is no need for a car than Albir Park is the one for you. Buses run frequently to Benidorm and Altea and the shuttle bus to Alicante Airport is only 8€. The park has their own pool team and who are currently league champions for the second year running. This Park is ideal for those looking to retire in the sun or for those just looking for a holiday home near Benidorm. Approx 100sqm plot = £4,387 per annum ( includes water, sewage, rubbish collection & insurance on your home) Paid annually. Electricity is metred at 45p per unit. Also a one off chage of £155 to supply a fire extinguisher which also includes the first 10 years annual servicing. Why not come and see the park for youself, there are 2 different ways of visiting the Park. 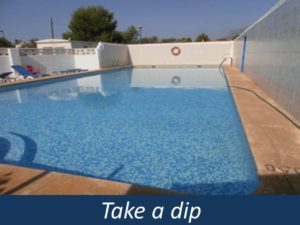 Costa Del Paradise can arrange for you to stay at the Park in a mobile home for 2nights, this includes pick up and drop off at the Airport. Price £65pp( based on 2 sharing) Total £130. Payable in euros on arrival. Flights not included. It you are out on holiday and would like to pop along to the park please contact us and the Park owners will gladly meet up with you and show you the Park.